Click this link to get your officially licensed Notre Dame t-shirts for just $5 from Dugouthats.com!! Eleven games, no starts, 10 at-bats, three hits, and four runs scored. That stat line was the sum of Notre Dame’s Herman Petzold after four years as a reserve infielder under the Golden Dome. Herman Petzold was 5-for-12 last week after going 3-for-10 in his first four years combined. All that changed in one swing of the bat on the second day of the 2011 season. It was a moment that would knock a huge self-imposed chip off Petzold’s shoulder, but it was also a moment that almost never happened. Petzold and his teammates were trailing Purdue 2-0 in the top of the third inning on day two of the Big East/Big Ten Challenge. He was in the starting line-up for the second straight day (and second time in his career) under new Irish head coach Mik Aoki. The fifth-year senior stepped to the plate with the bases loaded, but quickly found himself down in the count 0-2. Petzold stroked the next pitch into the gap in left centerfield. Matt Scioscia scored, Alex Robinson crossed the plate and Mick Doyle scurried all the way around from first base to touch home as well. Petzold was thrown out at third base trying to stretch his double into a triple, but by then it didn’t matter. His 3-run double propelled his team to a record-setting 19-2 victory while unleashing four years of frustration at the same time. At the end of his first three career starts, Petzold had batted .417 (5-for-12) with two doubles, three runs scored and a team-high five RBIs to help his team to a 2-1 record and land a spot on the Big East/Big Ten Challenge All-Tournament Team. A career in one weekend, but it’s only half the story. The real story was the fact that Petzold was even on the Irish roster, let alone in the starting line-up in 2011. When Mik Aoki became the head coach at Notre Dame last July an email to announce his hire was sent to all the players on the team roster, but that roster didn’t include the name Herman Petzold. The infielder from St. Clair Shores, MI had used his four years of eligibility under former Irish head coach Dave Schrage, and there was little reason to believe a little used reserve would come back for a fifth year. Mik Aoki took over at Notre Dame on July 13, 2010 after four years at Boston College. Petzold had other plans. He sent Aoki an email urging him to let him return for one more season. That’s where the chip came in. Fifth-year seniors in college baseball are rare, but most guys who do come back have been daily contributors, maybe had an injury along the way, but hadn’t quite done enough to get drafted. Petzhold was a walk-on who had played in 11 games from 2007-2010, but that never kept him from thinking he should have been on the field. Petzold does not disagree about that boulder sized chip lodged on his 5’10 frame after watching from the bench as his team went 119-104-1 over his first four seasons in South Bend. To convince his new coach to allow him to come back, the double major in finance and mathematics gave Aoki some tangible evidence to go on. Petzold had been named an All-Star in the Coastal Plains Summer League after his junior year in 2009. 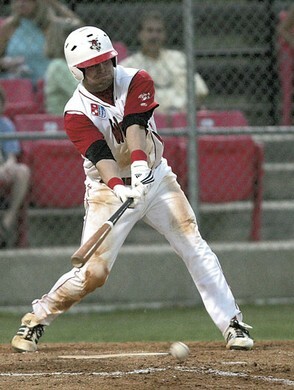 He followed that with a solid 2010, batting .284 with a home run, 23 RBIs and 26 runs in 48 games and 176 at-bats for the Florence Redwolves. Those numbers drew interest from Division II coaches who talked to Petzold about transferring to use his last year of eligibility. The numbers also piqued Aoki’s curiosity in the kid who wasn’t on his roster. So Aoki made Petzold an offer. He could come back for fall workouts to give the new staff a chance to see him and evaluate his play. Petzhold's play with the Florence Redwolves in the Coastal Plains League helped convince Mik Aoki to give him a shot last fall. Based on that evaluation, Petzold could either stay at Notre Dame for the 2011 season or move on for one season at a DII program. Petzold had those same kind of DII offers coming out of high school, but this was Notre Dame and this was his team. After four years as a reserve infielder, he spent the fall working in the outfield. There were still no guarantees, but by the time fall camp closed Aoki told Petzold he had a shot. “Really what I told him at the end of the fall was, listen, I don’t know ultimately how it’s going to shake out, but if I had to project it at this point and time (in October) I can tell you that I think you’ll take on a more significant role than you have at any point prior to this year,” said Aoki. Aoki couldn’t put a tangible number of at-bats or games on the table, but he felt like Petzold’s bat fit into what the new staff was looking for. He kept putting up quality at-bats when the team began practice in January and found himself in the starting line-up for the first time in his career when the Irish opened the season against Michigan State last week in Dunedin, FL. “After the fall working with the new staff I felt a better bond. I’m happy with my decision,” Petzold said after his big opening weekend. Petzold says he’s not the only one to benefit from the fresh slate provided by Aoki and his new staff. Aoki said Petzold’s bond with his team is something that has been obvious since that first email. Three starts, five hits in 12 at-bats, and five RBIs. Numbers from three games that eclipse the stats and frustrations of four years. That chip has the fifth-year senior off to a good start, but that’s just what it is- a start. Both player and coach agree there are many more games to be played this season. Maybe the squirrel just took a chunk out of that chip. Press play below to listen to Petzold’s interview with Collegebaseball360.com Editor Sean Stires.